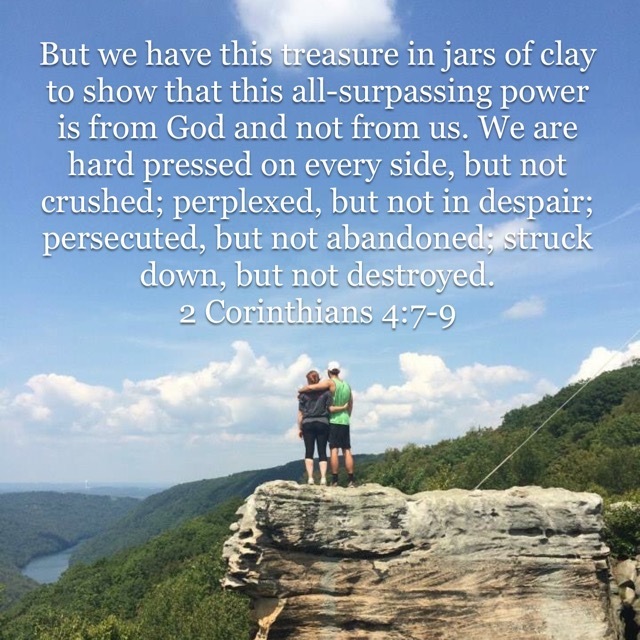 This verse from 2 Corinthians speaks to how, and why, we and so many others who know Christ can persevere through hardships and difficult circumstances. During the trials of life, we are not abandoned, crushed nor destroyed! To the contrary, in spite of our frail humanity, beautifully presented in 2 Corinthians as being housed in “jars of clay”, Christ’s power is evident and he is glorified! This entry was posted in Spiritual Encouragement, Thankfulness and tagged Christianity, Encouragement, faith, spiritual growth, trials, trusting God. Bookmark the permalink.